ONE OWNER FROM NEW + LOW ROAD TAX ONLY £30 A YEAR !! Discover the Chevrolet Trax, a small SUV that's always ready for the next adventure. Far from being just another small SUV, a used Chevrolet Trax will allow you to explore the world from a different perspective. Described by the manufacturer as a "city-smart SUV" the Trax's compact body and agile handling make it perfect for navigating through busy, narrow streets and squeezing into the tightest of parking spaces. 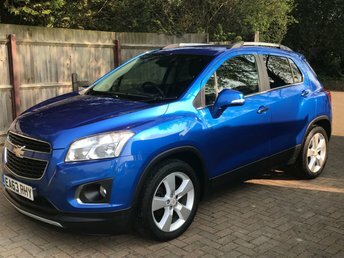 Get exploring today by browsing the complete range of used Chevrolet Trax for sale in Northfleet right here on our website. All of the pre-owned vehicles for sale on our site have been thoroughly checked and tested before going on sale, meaning you can buy with complete confidence.